L. carniolicum is native to the Balkans into Austria and northeastern Italy. Sometimes called the 'Golden Apple Lily', its species name comes from the historical redion of Carniola, taking in parts of modern day Slovenia which it is said to be most abundant. It has a very wide range of colors running from red to golden yellow. Color can even vary within a single colony. Yellow seems to be the dominate color in its southern range. In his book 'Growing Lilies', Derek Fox reports that "the seed has epigeal germination which may be delayed, but is better described as erratic". Title photograph by Pontus Wellstan, taken at the public garden estate of the late Timothy Whiteley of Northamptonshire, UK to whom his book on lilium species was dedicated. A lovely example of the orange tones in the color range of this lily. Photo insert #1 is from Wikimedia Commons and was taken by Hedwig Storch. Copyright Hedwig Storch. This file is licensed under the�Creative Commons�Attribution-Share Alike 3.0 Unported�license. 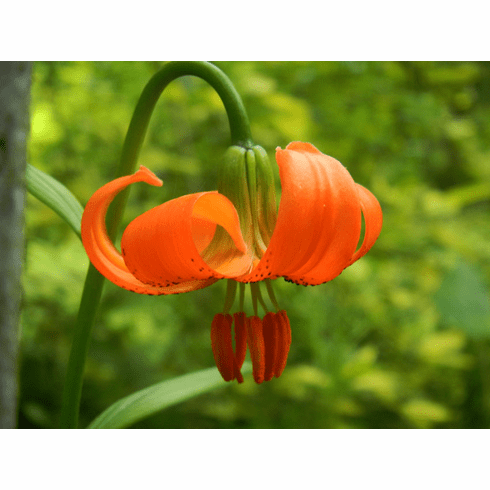 Photo insert #2 is from Wikimedia Commons and was taken by Alice Chodura showing the reverse of the red form of this lily. Copyright Alice Chodura. Photo was cropped from original. This file is licensed under the Creative Commons Attribution 3.0 Unported license. Photo insert #3 is from Wikimedia Commons and was taken by Meneerke Bloem showing the golden yellow form. Copyright Meneerke Bloem. Original photo was cropped. This file is licensed under the Creative Commons Attribution-Share Alike 3.0 Unported, 2.5 Generic, 2.0 Generic and 1.0.